China must square up to its responsibility in the North Korea nuclear crisis. The Donald Trump administration is leading overdue, intense international pressure to stop Pyongyang’s nuclear and missile programs by placing the threats as the top priority in dealing with its patron, Beijing. However, the People’s Republic of China (PRC) has not yet fundamentally changed policy and is still deflecting direct responsibility to stop North Korea, also known as the Democratic People’s Republic of Korea (DPRK). During their phone call on April 24, President Donald Trump criticized North Korea’s belligerence and destabilizing actions, but PRC ruler Xi Jinping asked “the parties concerned” to be restrained. China’s deflections are unconvincing. It is reasonable to expect China to act urgently and responsibly with a changed calculus of the threats to peaceful order. If China fails to accept responsibility for North Korea, then it bears blame for the rising risk of conflict. It is in China’s interest to stop North Korea before the United States and its allies are forced to act in defense. China’s opinions are not convincing or reasonable. The United States and ROK promptly rejected the PRC’s “dual suspension” proposal as basically “dead on arrival” and continued their Foal Eagle military exercises. 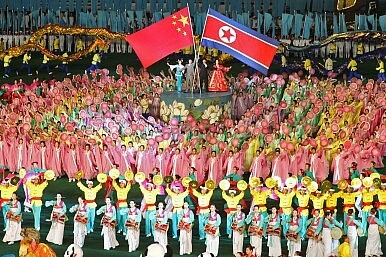 Even North Korea rejected China’s call and vowed to continue nuclear tests. China has posed no serious pressure to stop North Korea and ignored the resolutions of the UNSC though Beijing is a permanent member and has coercive power. Other countries can see China’s proposal as an attempt to deflect blame in this crisis. Indeed, Beijing’s message failed to persuade Pyongyang to stop its threats. Within hours of the UNSC’s meeting on April 28, North Korea defied international pressure with a ballistic missile test (which failed and blew up over North Korean territory). On May 9, Kim Jong-un’s ambassador in London opined that the DPRK leader still plans to conduct a sixth nuclear test. China points to the U.S. military presence in the ROK as a reason for the DPRK to develop its nuclear threat. China’s historical revisionism is not convincing, for it ignores the security dilemma on the Korean peninsula. The U.S. alliance with the ROK is the direct result of the DPRK’s hostility and aggression against the ROK and the region. Next month will mark the 67th anniversary of the North Korean People’s Army invading the ROK on June 25, 1950. During and after the Korean War, the PRC has supported and protected the DPRK regime. The PRC has preferred the status quo for the sake of so-called “stability,” fearing a worse crisis would follow from pushing the Kim regime into the abyss. However, the status quo is destabilizing. Moreover, Tillerson clearly stated the U.S. goal is denuclearization, not a collapse or change of the DPRK regime or accelerated Korean unification. Furthermore, despite decades of apparent fragility, the regime has proven to be resilient. Meanwhile, the United States and other countries are warning that they are no longer patient. China also needs to recognize that Japan and the ROK likely would have developed a nuclear deterrent if the United States did not provide consistent assurances and extended deterrence to its allies. Instead of taking the same approach to North Korea, China has not stopped its neighbor’s nuclear programs. Beijing’s persistent support for Pyongyang could have induced it to negotiate with a greater sense of security, but bolstering the regime proved counterproductive as it became less willing (if it had been willing) to forego its nuclear programs as capabilities improved. Despite PRC-sponsored talks with the DPRK and its isolated position in the talks, that regime retained diplomatic leverage, economic gains, weapons proliferation, capability for additional nuclear tests, and time to stall denuclearization. China’s narrative of blaming the United States for not engaging with the DPRK is not factual. For example, President Barack Obama visited Beijing for a summit in November 2009 and discussed the goal of the verifiable elimination of North Korea’s nuclear programs, including through a resumption of the Six-Party Talks. Then, Washington signaled willingness for direct dialogue by sending Special Representative Stephen Bosworth to Pyongyang in December 2009 to seek North Korea’s return to negotiations. However, re-starting the Six-Party Talks ran into an obstacle when North Korea attacked South Korea’s naval ship, Cheonan, in March 2010, killing 46 sailors. In June 2010, Obama criticized China for “willful blindness” toward North Korea’s belligerence. China refused to condemn North Korea. China’s entities even extended assistance to North Korea’s ballistic missile program, according to the U.S. director of national intelligence’s unclassified reports to Congress. In an egregious example, North Korea’s military parade in April 2012 showed an apparent KN-08 intercontinental ballistic missile (ICBM) on a 122-ton, 16-wheel transporter-erector-launcher (TEL), one of four such TELs that originated from China. At a hearing of the House Armed Services Committee days later, Defense Secretary Leon Panetta testified that the PRC provided help for the DPRK’s missile program. Recent information disclosed that a PRC state-owned entity maintained a joint venture with a sanctioned DPRK company for a decade. If China calls for “responsible actions,” it needs to start urgent actions with a fundamental change of calculus. China’s worn-out narrative about dialogue fails to recognize North Korea’s relentless attempt to acquire nuclear weapons. The United States and other countries are not crazy, taking the same approach repeatedly while hoping for a different result. As the U.S. Pacific Command’s commander, Admiral Harry Harris, testified bluntly to Congress last month, he must consider every possible step to defend the U.S. homeland and our allies in Japan and South Korea. Shirley Kan is a retired Specialist in Asian Security Affairs who worked for the U.S. Congress at the non-partisan Congressional Research Service (CRS). Should We Believe North Korea Is Willing to Denuclearize? Take the claim with a grain of salt -- until we know what Pyongyang wants in return.